Sensitive. Temperamental. Bruises easily. Doesn’t like to be touched … characteristics of a true Pinot Noir grape. Ironically, these also describe my daughter to a tee. Is it a mere coincidence that a Pinot is her wine of choice? I am far from being a wine connoisseur or collector. Becoming a sommelier will never be a career goal either. Since 2010 however, beginning with my first Chianti in Italy, I am developing an appreciation for the production and consumption of the libation that dates back to ancient times. It was Noah who planted the first vineyard after the flood. This summer, traipsing through the unbearable heat, I had the opportunity to visit the small family-owned boutique, the Zafririm Winery, in the Judean Hills of Israel. The delicious red blends incorporate tales of biblical history, archaeology, and geography. They are pleasing to the mind, as well as the palate. I have come to understand the concept of terroir; the factors – minerals, soil, temperature, and other environmental characteristics – that exert influence and affect the development and growth of grapes. Whether in Italy, France, Israel, Spain, or New Zealand, grapes – much like people – adopt the flavors of the culture in which they are raised. And so, my mind was opened to wines of California. It had been almost three decades since I last visited San Francisco. While I don’t particularly avoid California (I’m totally an east coast girl! ), I also don’t seek compelling reasons to justify a trip there. But now, with my kids living in Palo Alto, I have the perfect excuse. 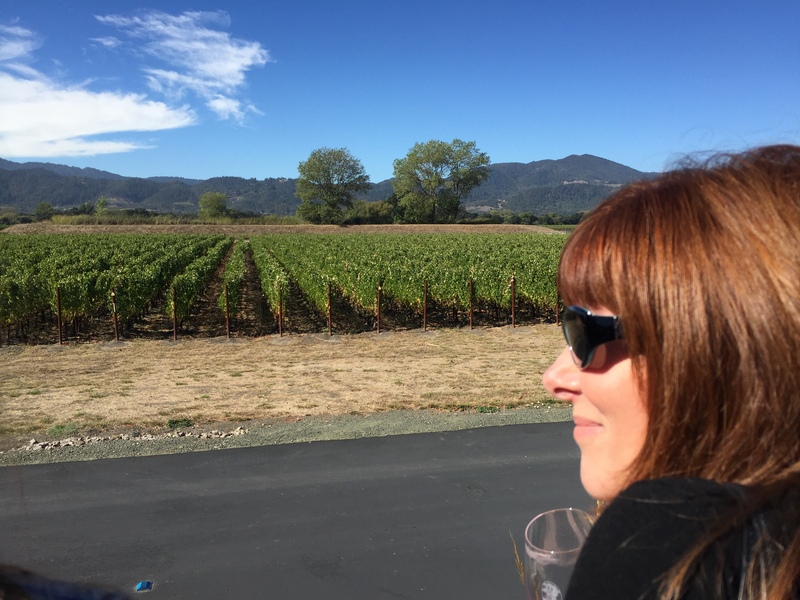 Visiting wineries in the Napa Valley was a wonderful way to spend time with my young adult children, appreciate the holiday of Sukkot, and celebrate life’s beauty and opportunities. The ambiance of the weekend was perfect. The cobalt skies were crystal-clear. The bright white-feathered clouds looked painted. The Granny Smith green leaves were still on the trees. And the air was crisp and cool in the early mornings and late evenings. The trip also enabled me to continue my education in oenology. Given that we only had one free day to explore, four wineries offered plenty of wine to taste and styles to explore. My current favorites include the Silver Oak and Frank Family vineyards; though I will not abandon my tried and true Amarones, Brunellos, or New Zealand Marlboro region Sauvignon Blancs. Regardless of the preferences of your palate, I find the process of wine-making – from the growing of the grapes to the aging in barrels – to be far more art than science. It is driven by passion, patience, and faith. If I were to liken my personality to a wine, I’d be a Cabernet Sauvignon … Deep red. Full-bodied. Medium acidity. Peppery. Long legs. Warm. And, of course, aged to perfection.